Despite how it may seem, I really do enjoy the holidays. I enjoy the community giving aspect of the holiday season, though I am not religious myself. Halloween always freaks me out because the next day is November 1st, which means Thanksgiving is coming and then Christmas. For most of my adult life I have managed to avoid the cooking and organizing and other EF-heavy tasks that I stink at. When it became evident that I needed to take some responsibility I created my holiday planner, which certainly helps. But if you really think about it…the Holidays bring out the crazy in everyone. I just choose to be open about it. Enjoy my poorly written poetry. Nothing like hanging out with your oldest friends to make you feel like a loser. I mean some of them are “regular” people like me, but many are professors or doctors or uber successful business owners. This website is my business. I love what I do – but when I start to compare myself to others it leads nowhere good. The holidays are hard enough without feeling like you are an epic failure at life. 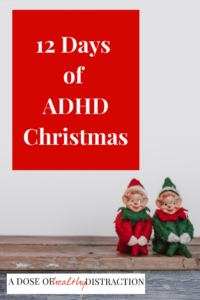 On the second day of Christmas ADHD gave to me…. And hats, and scarves and outdoor apparel of all types. Everyone acts like organizing and storing things is so great. But I cannot remember where I put our winter apparel and I forget I owned it 90 seconds after it is put away. Am I the only one that has to buy new winter accessories every year because I misplace everything? On the Third day of Christmas ADHD gave to me…. Red wines I mean. The holiday season would not be complete without at least one really bad hangover. In my case this is often associated with red wine from the Rhone region of France. I do a pretty good job of avoiding a Thanksgiving hangover, and Thanksgiving cooking, and pretty much anything that doesn’t involve sleeping. Sleeping is a great way to avoid overindulging. I prefer to do my holiday shopping in my pajamas so 90% of what I buy is online. Online shopping would not be a problem except that I can never remember the passwords for my online accounts. I only use them once per year. Every year I have to reset my passwords for Toys R Us, Shutterfly, Target and Ebates. Am I the only person who has a major issue with passwords? Ok so this happens all year – but it is particularly bad at this time of year. Between holiday parties, school events, birthday parties and the like, I usually forget something once per week. At this point it seems appropriate to postpone the rest of my personal appointments until after the New Year. The only appointments I am keeping are with my trainer and my chiropractor. I need something adjusted, and it isn’t my spine. If I do anything right it is paying my bills. When I was young I had some issues with impulsive spending so now I am pretty controlled. This year the Hubs is tracking it so he gave me a budget. As long as I know the limits I am good. 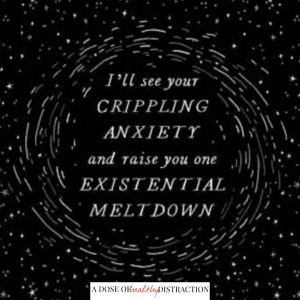 For many ADHD’ers this is a problem area. Idea: Pick a day to do all your shopping at once. This way you know exactly what bills are coming. It’s actually harder to track your spending when you buy a little here and there. So I spend it all in about 2 hours on Cyber Monday. I love having a real Christmas tree. I love the smell and I love the look of a real tree. But this year I invested in a nice fake one. And my child didn’t freak out! Each year some disaster befalls our poor tree. The dog knocks it over drinking, or the cat leaps at it from afar. One year the hole in the bottom was crooked so our tree sat at an angle. Last year we scratched up our ceiling. It is always something around here. Shopping online when you have ADHD is one thing – shopping in public is a whole different ballgame. I get completely overwhelmed with music, smells, and… people. In the grocery store the other day a woman ran into me with her cart and said, “excuse me”, as if I were in her way. On instinct I moved and said, “oh I’m sorry.” But I noticed half a second later that I wasn’t exactly in the middle of the aisle. She hit me, so why was I apologizing? Something about the holiday season makes the crazy come out in even the most sane people. The Elf thing gets me annoyed every year. 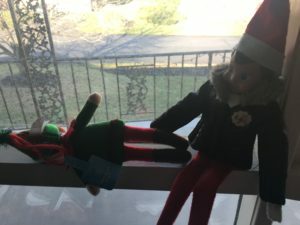 I can barely remember what I ate for breakfast each day but I am supposed to remember to pose my son’s Elf every single night! Then you go on Facebook or Pinterest and everyone is spending hours creating these detailed Elf scenes. My child renames his Elf each year because we can never remember what we named him the year before. I’m not even giving him the option this year. I need help taking care of my house. I admit this openly and if I could afford it I would get a cleaning person in a heartbeat. 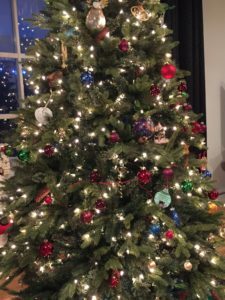 If I have to decorate the house, get a tree, and shop for everyone from both sides of the family, a clean house is simply not going to happen. Families argue. I know this. But between my normal ADHD stuff, anxiety, and the holiday season my tolerance for petty arguments is extremely low. I want to see everyone, I really do. I just don’t want to listen to them bicker and talk smack about each other. It is exhausting. This year I plan to take out my frustrations through exercise. And avoidance. 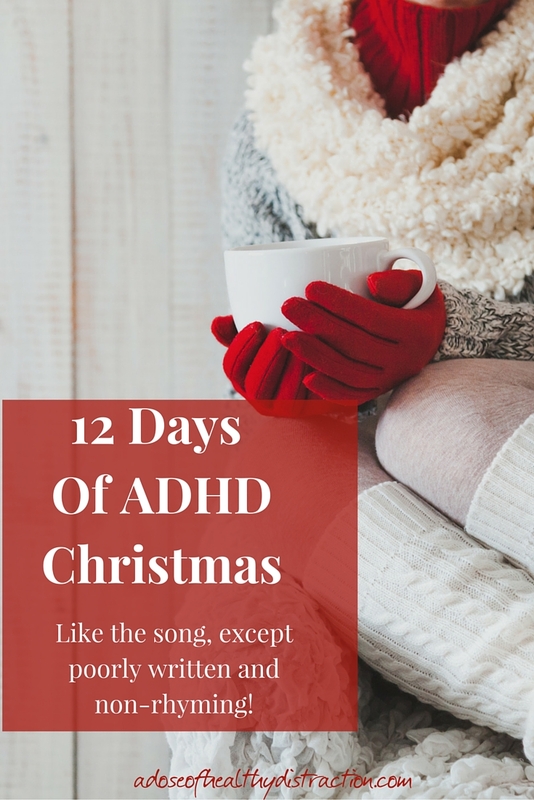 On the 12th day of Christmas ADHD gave to me…. The food, the crowds – the whole atmosphere is very overwhelming. By New Years Day I am exhausted, and ready for a winter hibernation. ADHD adds an extra element of anxiety to the holiday season. Try my holiday planner to get you through the New Year! Do your ADHD symptoms get better or worse this time of year?